In emergencies, information needs to be collected and understood quickly. Dharma can easily be used to carry out these types of rapid needs assessments (RNAs), whether there's a need to know about health care, food, structural damage, mapping, or anything else. It's particularly useful in low-resource situations because staff can be tracked, allowing administrators and managers to monitor potential issues and address them in real time. The Guests feature makes it easy to collaborate with partners, governments, and other agencies in order to deliver services quickly. To set up a typical rapid needs assessment form, create a project and identify your sites in the Sites section of Project Settings. Since this is a one-time assessment, there's no need to set up time parameters. However, if you need to add external viewers who can see the results of one or more dashboards (for example, an NGO providing temporary shelter), you can easily set that up in the Users section by adding them as Guests. You'll add data collectors in the Field Staff or Field Staff Grouping sections. If you're distributing tablets to different collectors each day, you may wish to set up email accounts specific to each tablet rather than gathering collectors' individual email addresses. Once your project is set up, you can start building your form. An easy way to transfer paper forms into Dharma is to create new categories for every section on the form. RNA forms often contain tables asking collectors to answer a short set of the same questions for multiple items. For example, take a look at this set of questions about water supply. In Dharma, the easiest way to do this is to break apart the table by question, so we can get a direct comparison of each choice. We'll start by counting the number of sources of each type. 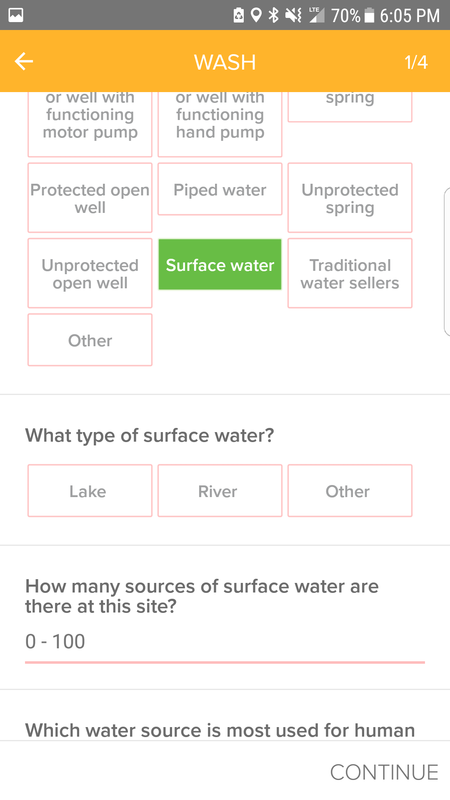 To do that, we can create a multi-select multiple choice question that will allow us to ID which types of water sources are present. Now what we'll do, in order to prevent our collectors from having to enter data about sources that aren't there, is create a series of follow-up questions that essentially say, "IF this is selected, THEN ask how many sources there are." We'll do it for each option. This also allows us to bring in other questions that are tied specifically to each option. For example, for SURFACE WATER, the original form asks us to specify if it's a lake, river, or another form of surface water. We can add that question to the skip logic for that choice as well. What that does is streamline the mobile collector experience. Note that the question about surface water types doesn't appear until we choose SURFACE WATER in the first question. Once we've done that, we can focus on answering the questions we're really interested in - how different types of water sources compare to each other for different types of consumption. 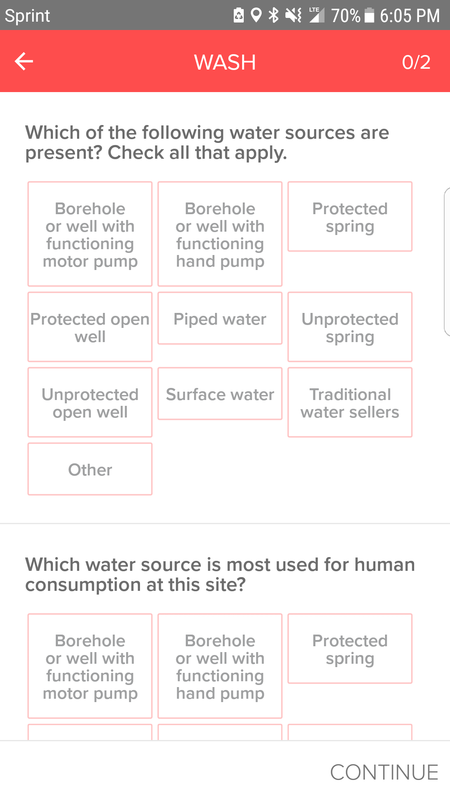 We'll do that by creating another set of multiple choice questions, this one asking about water source consumption (the top row of the table). We don't want to make this a multi-select question, because we want to know which source is used the most - which means we need to make collectors choose one and only one. What that will generate is a results window that lets us compare which sources are primarily being used for human consumption. Looking at the graph, we can easily see that protected open wells are being used far more than protected springs - information that can then inform our response efforts. Once your form is set up, it will appear on your collectors' devices. They'll be able to upload them automatically if there's network service; otherwise, forms will upload by themselves as soon as the device is within a network's service area.